Summer is here, which means I have more time to read to my kids! Both of these books were finished before school ended, but I thought I better combine them because we have a lot more now coming down the pike. I've noticed that when a read aloud has been rather slow and tedious, my kids and I tend to turn to something quick and fun and familiar afterwards. This happened most recently after we finished Rascal. Don't misunderstand, we liked that book a great deal but it wasn't a fast book for us, and I could tell that we needed a little pick-me-up to rekindle the reading bug. It should come as no surprise that the author we chose to remedy the problem was Beverly Cleary. She is our tried-and-true favorite, and Ramona was just the ticket. Ramona is known for her seeming talent for finding mischief and getting into scrapes, but in this book, she thinks she is past all that. After all, she is seven years old and in the second grade. In fact, when she overhears someone compare Howie's annoying little sister, Willa Jean, to herself, she gets a little offended. Her pride takes another blow when someone else refers to Beezus as "her mother's girl." But still, no matter how much she wishes it or tries to be more grown up, Ramona can't help getting into trouble. In this installment, she dumps a bottle of blueing all over herself and Howie, squeezes out an entire tube of toothpaste, and tries to run away. She is definitely more conscious of her actions (and more defiant about them when she knows it's something she shouldn't be doing), but she is still very much the same Ramona who, at four years old, ate a bite out of every apple in the basement. The similarities between Willa Jean and Ramona throughout the book cannot be missed, and it is a brilliant tool for expanding Ramona's character. Through Willa Jean, we are able to look at Ramona from all angles: how other people see her and how Ramona sees herself, and we're also able to draw our own comparisons. Seeing Willa Jean in action reminds us of Ramona's escapades from years past. We also see how she's matured while at the same time staying very much one hundred percent Ramona. One of my other favorite parts of the book is when Ramona's parents get into a really big fight one evening after a very long day. There were delays with picking up the car from the repair shop after work, and so everyone is tired and hungry when they get home. They expect dinner to be ready and waiting for them, but Ramona's mother had forgotten to plug in the Crock-Pot when they all left that morning. Their only other option for dinner is pancakes (but they still plug in the Crock-Pot so that they can eat the stew the next night, and I was thoroughly grossed out about that), but Ramona's parents are sarcastic and rude and start throwing insults at each other (or actually, at Mr. Quimby's grandmother) until Mrs. Quimby grows so frustrated, she swats Mr. Quimby with the pancake turner and stalks out of the room. 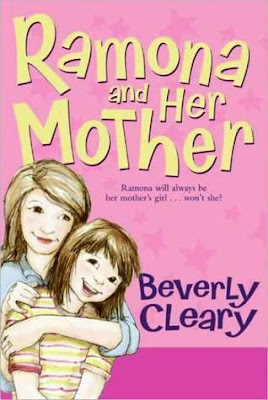 This book just had all the heart and humor and authenticity I've come to expect from Ramona. You can tell we haven't been ripping through this series, and it's because I never want it to end. I always want there to be a new Ramona book to fall back on when we need something light but substantial. I guess eventually, we'll just have to start rereading. That will be fun, too. After the boys and I finished Ramona and Her Mother, we decided to move onto another partially finished series and read the next installment in The Chronicles of Narnia. I never read this book as a kid, but it's now the third time I've read it as an adult, and that kind of surprises me since I don't reread a lot of books, and I wouldn't list this as one of my favorite books of all time or even one of my favorites in the series. Still, it's the type of book that holds up to a reread very well. Lucy and Edmund Pevensie have been sent to spend the summer with their Uncle Harold and Aunt Alberta and insufferable cousin Eustace (who, at least in the beginning, all bear a rather unflattering resemblance to Uncle Vernon, Aunt Petunia, and cousin Dudley). When they are alone, they relive their Narnian adventures, and there's one picture in a tucked away bedroom that especially reminds them of Narnia because it looks like a Narnian ship floating on the sea. One day, as they're looking at it, Eustace comes along and starts taunting them. But that quickly ends when the ship in the picture literally starts moving and the waves start splashing and then they're actually in the picture and being pulled up out of the water into the ship. 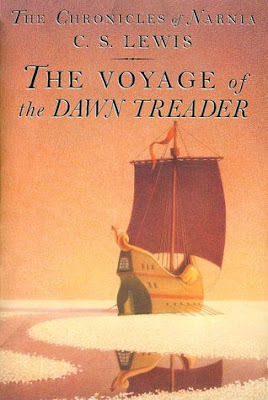 The ship, as it turns out, is indeed a Narnian ship, and who should be on board but Prince Caspian himself. They are searching for the seven lords who left when Caspian's uncle, Miraz, was in control of Narnia. Lucy and Edmund are thrilled to be a part of the adventures, and Eustace eventually comes around too. When I read this book for the first time, my favorite scene was definitely the one where Aslan helps Eustace shed his skin after he becomes a dragon. The symbolism made such a profound impact on me. This time, it was my kids who loved that scene (which I totally called before we read the book), but I found myself touched by other parts of the story far more. One of those instances happens towards the end of the book when they get to, what they later call, Ramandu's country. They find a table spread with a bounteous feast and three of the lords sitting at the end of it, deep in an enchanted sleep. A girl comes out to greet them and tells them about what happened to those three lords and also the history of the table. At the end of her narrative, Edmund says, "I'm sure I don't mean to be rude. But we have had a lot of queer adventures on this voyage of ours and things aren't always what they seem. When I look in your face I can't help believing all you say: but then that's just what might happen with a witch, too. How are we to know you're a friend?" The girl responds, "You can't know. You can only believe . . . or not." That really resonated with me (and actually brought me quite close to tears) because I feel like that's where I am with my faith right now: I can only believe or not. And I choose to believe. Those are the things that stuck out to me this time, but I know that if, or I should probably say when, I read this book again, there will be other things that make an impression. It's just that kind of book. What books have you been reading to your kids lately?